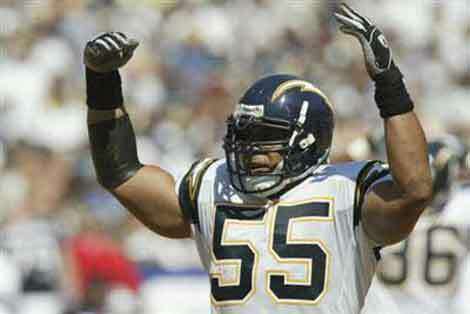 Today was truly a sad day for the NFL, as Junior Seau was reported dead by a self inflicted gun shot to the chest. This is a huge blow to the Seau family, as well as the San Diego community. The heart sobbing interview Mrs. Seau gave in front of her son’s former home, would make the strongest shed a tear. Her mixture of words and sobbing was one of the most heart felt moments I have witnessed in quite awhile. There has been several instances within the past couple of years, that a former NFL player has taken his life. Just last year former Chicago Bear, Dave Duerson took his life in the same manner it appears Junior Seau took his, that is with a gun shot to the chest. Along with finding his body covered in blood, his family and authorities found a note that explained why he did not shoot himself in the head. The note read, “please see that my brain is given to the N.F.L brain’s bank.” His ex wife, who divorced him four years before, said he always described pain from the left side of his brain. She said his vision and memory almost faded instantly and he did not know how to cope with the fact that is body was degenerating right before him. Duerson was by all account a happy and financially successful man, until he was forced to file for bankruptcy and his once prosperous food distribution went into decline. That is when his family noticed a dramatic change in his mood and how he interacted with others. Even before Duerson went through his dilemma, he worked along side the committee that reviewed disability claims by retired players. He was very familiar with the sharp incline of former football players suffering from dementia, players like Fred McNeill. Duerson used his brain as a very direct message to the NFL, that they need to provide assistance to former players who gave their bodies up for the progress of this league. Now with the death of Junior Seau, the NFL has to take a deeper look at what causes theses players to go in a sharp decline mentally. There is no denying it, the NFL is a dangerous, violence game. In order to change that, you would have to eliminate the game. There is no way you can remove the dangerous aspect of the game without removing the game all together. I do not believe it is the game, it is the players that play the game. They throw their bodies recklessly at other players, not thinking, of course in the action, what problems they will have in the future. After this incident, NFL can no longer just talk about making the league safer and providing assistance to retired players. It is sad at the age of 43 that Junior Seau took his life and though nothing initially can be diagnosed as why he took his life, but a sure bet could be placed on the fact after playing football for more than half of his life took a toll on his brain. The number of instances your head takes traumatic hits during a football career is astounding. Seau was revered as a quality teammate and neighbor within his community. Always willing to help out those who were less fortunate and gave back time and money to his former high school in southern California. He played 20 years all together in the NFL with the San Diego Chargers, Miami Dolphins, and ended his career with New England Patriots. He is a sure Hall of Famer for the class of 2015, it is sad this will be his lasting memory in so many fans mind. His family shall remain in the prayers and minds of all those who are witnesses to this epidemic that will affect so many more players if something is not done by the NFL and the NFL Players Association. This entry was posted in Football, Home, National and tagged Junior Seau, NFL.